Google Music Beta is a new invite only service from Google. It allows you to upload your music to online Google Music account and then listen it online on computer or any Android powered mobile / tablet device. To sign up for Google Music beta service you need to request for an invitation. Make sure you check for basic Google Music system requirements before sign up and usage of this music service from Google. Currently, this service is only available to USA users. With too much focus on Google+ Plus, Google Music beta buzz has faded to some extent. Now existing Google Music beta users can send invites to other users (in USA). Once you receive invite, you can get started by creating new Google Music account and then start uploading your music online. 1. To send free invites from existing Google Music account, login into your Google music beta account at music.google.com website. 2. Look for Invite a friend option at top left part. 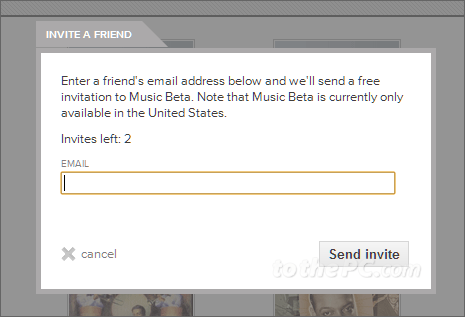 Click ‘invite a friend’ option and then enter email ID of friend you want to invite to Google Music beta. 3. Click Send Invite button for sending invitation to your friend. 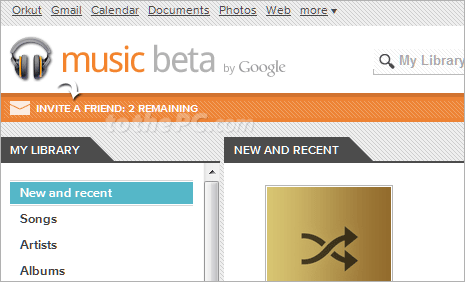 Ask you friend to open invitation email and click through confirmation email from Google Music beta. Then your friend can proceed with sign up and use of new Google Music beta service. Want free Google Music invite? We have 2 free Google Music beta invites as of now. Comment below with your email ID and you might be lucky one with Google Music invite. Please, send me an invite to Google Music. Hi, its maciejewski.radek on g-mail ;-) It would be nice if you send it… Thanks anyway.